One artist - thousands of ideas - how many projects! Barbara Dennerlein determines the music style in each one of her ensembles. But what a variety of constellations! They seem to be formed naturally, change in colourful moods, reflect each other and squire an exceedingly story of success, highly inspired and driven by lightness and happiness. "My music is full of variety, just like my feelings or the world I live in that influences and inspires me. Having one particular style or one way of composing would only reflect a part of the world that makes up my music." 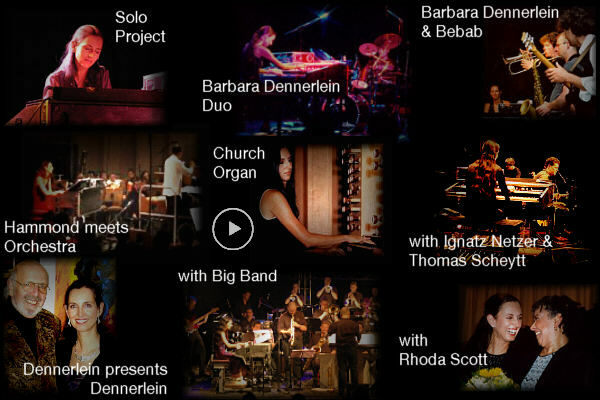 This is how Barbara Dennerlein sketches out the basic intentions behind her numerous CD releases and live concerts which she would like us to understand as a journey to her musical visions.